"Experiencing the wild is a connection with man's primordial spirit"
Adventures designed to preserve our planet - A wild heart loves the Wild. Love our planet - do something to make a difference in this life. The exhilaration of overcoming a physical challenge whilst conserving the world's wild places. Our emphasis is to journey through places of extreme beauty that touch the soul. Not just to visit, journey through & look, but to contribute actively to conservation, education and communities living in these areas. We have raised, circa 150,000 for the Desert in Namibia over 5 years. This year Sri Lanka, the rainforest & education has been added to our focus. Every penny raised by participants goes directly to the UK charities which are the conduit for overseas charities. Transparency of accounting is of paramount importance. Costs are separate from fundraising. 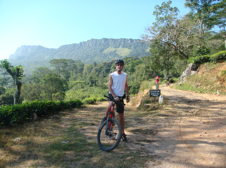 Cycling is the ONLY way to see Sri Lanka. Travelling in a car, is a misery of bumping and juddering over pot-holed roads. On a cycle, it's an adventure of discovery full of local colour, touching the soul of the island. 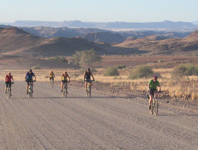 Come cycle the desert! If you've a hankering for adventure, exquisite scenery, eternal skies and if you want to do something good for Africa. This is an extraordinary life changing experience.